11-1 New Challenge at Ooh-la-la! So sorry that my post is a wee bit late today, but we were celebrating Halloween here with our little one and it was an exceptionally long day! 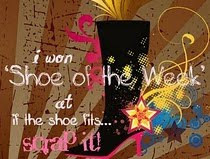 This week at Ooh-La-La, we have a new and exciting challenge! This time it is a theme challenge: "Remember Remember", so put on your thinking caps, dig out your ephemera and have a blast! We can't wait to see what you do! 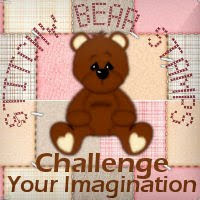 10-31 New Challenge at PIO sponsored by Purple Panda Designs! 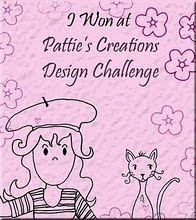 This weeks challenge at Pile it On is being sponsored by Purple Panda Designs! Purple Panda has some awesome digi's created by a wonderfully talented 16 year old named Kayla! 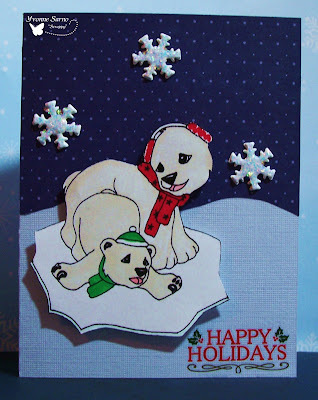 Check out 'Yin and Yang Winter' from Purple Panda which I've used on my card below! 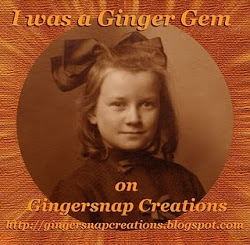 Then run on over to Kayla's Blog and see this and all of her other fantabulous digis! You'll be so glad that you did! Good Morning everyone! I hope you are enjoying your Halloween if you celebrate it wherever you are! I am likely getting ready to go out trick or treating with my daughter and trying to prevent her from eating too much candy! Hopefully, you will check out my card below whenever you are able! I just love to read your comments! 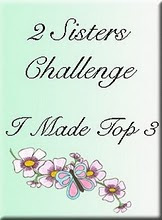 Today there is a new challenge up at the Crafty Ho Challenge Blog! The challenge is a recipe challenge: Use a circle, a leaf and buttons! Easy Peasy! 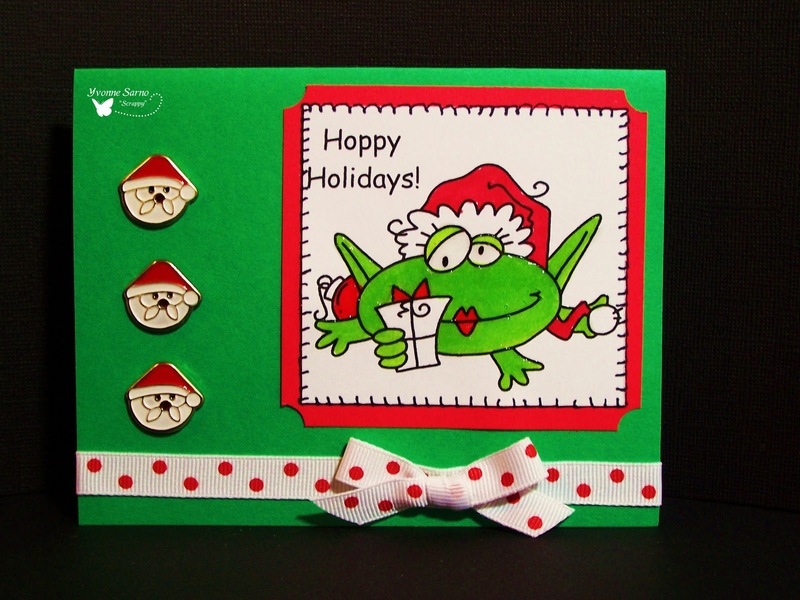 My card below features one of the brats from Bugaboo Stamps! 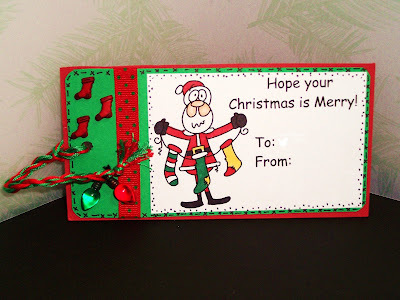 Join us over on the Crafty Ho Blog to link up your cards and to see what the other talented HO DT girls made! 365 Cards - 365 Cards Insp. 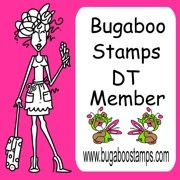 This week Bugaboo Stamps Catch the Bug Challenge theme is 'Swirling Twirling Fall'! 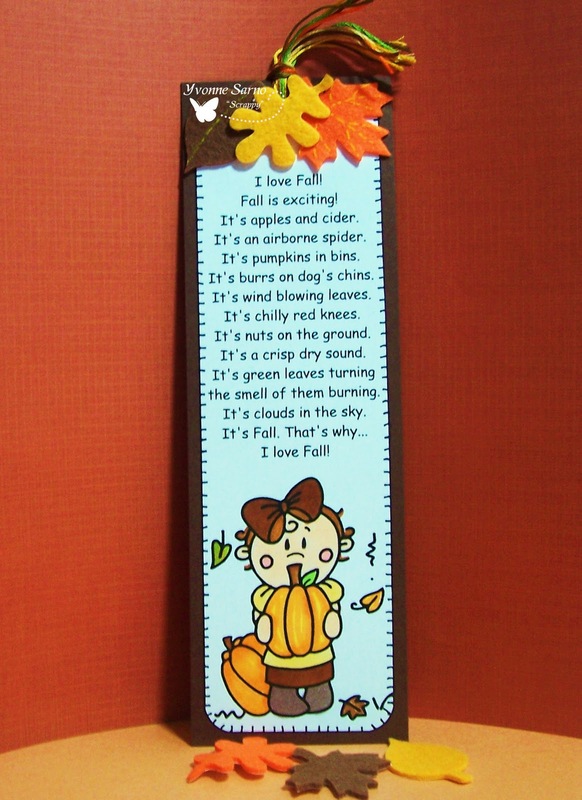 So get out your brown, orange, and rust papers and your favorite fall Bugaboo Stamps and join in the fun! 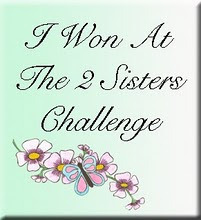 For complete rules and challenge info head over to the BUG BLOG for all the deets and prizes! We look forward to seeing your cards and projects. 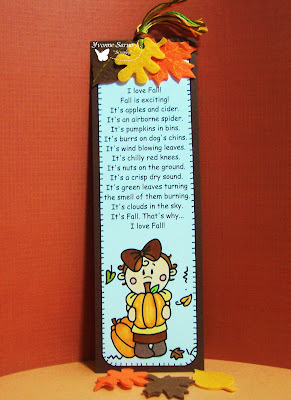 My BOOKMARK below features one of the cuties from Bugaboo Stamps October Collection along with a computer generated poem. You only have a day or two to nab them before they are gone - so hurry in to grab 'em! My daughter has already absconded with this bookmark to use in one of her easy readers! But think what a cool little sumpin' sumpin' these would be for your younger guests this Thanksgiving! 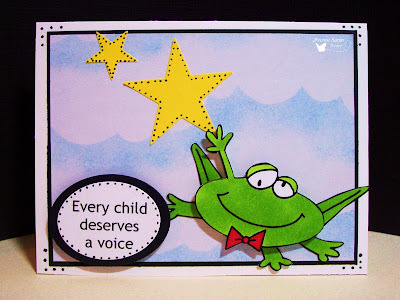 These would also be nice to send in for your kids or grandkids classmates and teachers too! InStyle Stamps - Color/Picture Insp. CRAFTY HO'S - Photo insp. 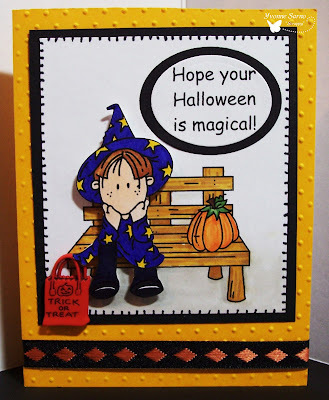 10/29 Freebie Friday at Bugaboo Stamps! 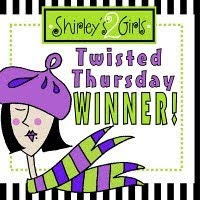 Today is Freebie Friday at Bugaboo Stamps! There are plenty of awesome digital stamps in the BUG SHOP as well as several brand spankin' new ones! 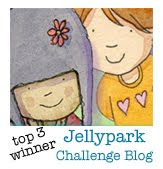 But Jodie (the wonderful and generous illustrator and owner behind Bugaboo Stamps) always goes one better! She also gives away one FOR FREE each Friday too!! This cute and cuddly digi belongs to a line called 'Santa'. The one I've used below and more are available in the BUG SHOP today. Be sure to check them all out and to nab your freebie while you're there! 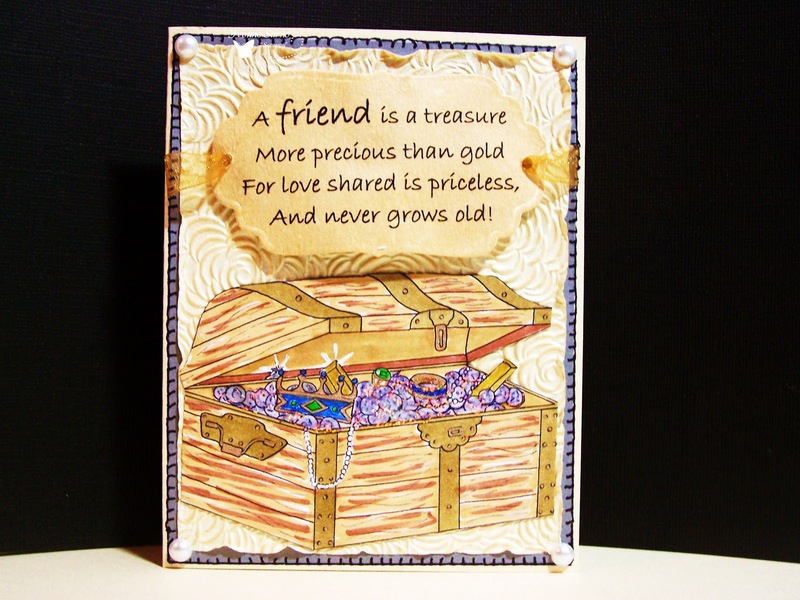 I'm back again to show off another of Designed to Delight's digital stamps! 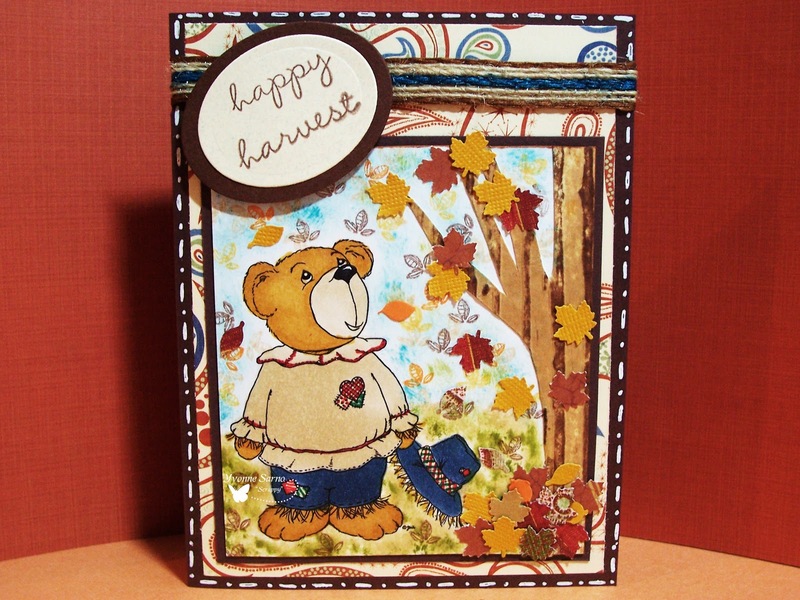 This cute Scarecrow Teddy is this weeks stamp for their progressive challenge! How cool is that?! Good Morning and Happy Thursday! Hope you all woke up on the right side of the bed and that the sun is shining wherever you are! 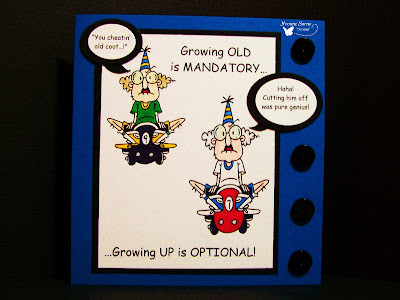 It's OBG day for the DT at Bugaboo Stamps, so some of the Bugaboo DT shows off their creations featuring some of their favorite Bugaboo Stamps images! 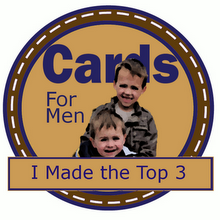 The images used are not part of the current release, but are still some of Bugaboo's best! I hope you like my card below featuring a digi from the Hoppy Occasions line at Bugaboo Stamps. Be sure to check out this digi and all of the other wonderful digis in the Bug Shop! Hiya everyone! 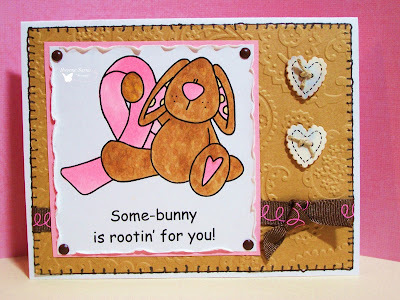 There is a new and fabulous challenge up at Aud Sentiments, sponsored by Meljens Designs. This week we are challenging you this time to use the sentiment "Thanks" or "Thank You"! 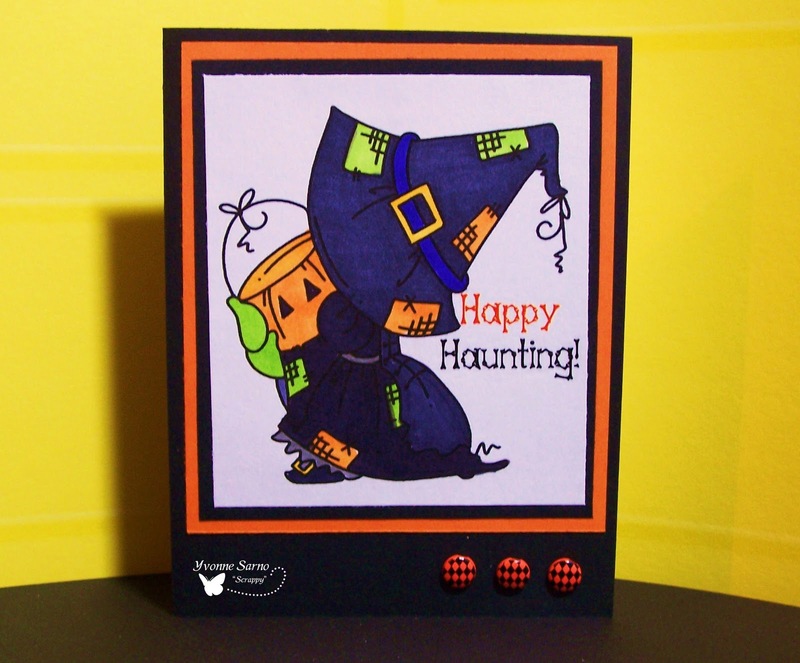 Hope you like my sample below featuring a super sweet digi from MelJens Designs! Karber Weekly - Inspired by Love! 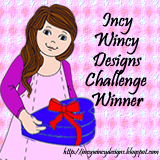 Another fun new challenge from Fresh Brewed Designs! 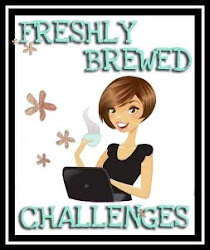 Fresh Brewed Challenges has a new challenge up, and it's a super fun sketch challenge! 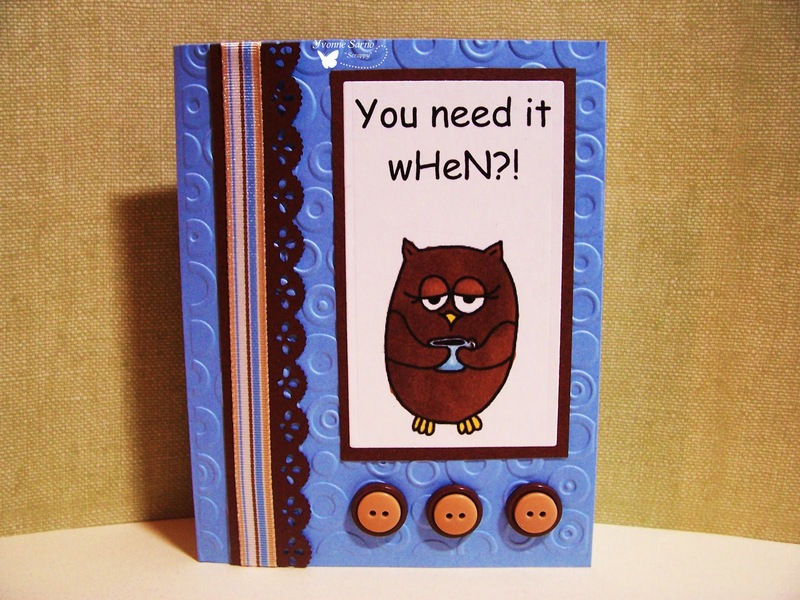 'Java Mama Owl' is available in the FBD Shop! I love this Fresh Brewed Design digi so much because it is so versatile! There are just so many ways to use it, so I've decided to show you one here. 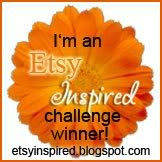 Why not head on over to join in the Fresh Brewed Design fun? 10/26 New Release at Bugaboo Stamps! Today is New Release day at Bugaboo Stamps, and I am super excited to share this afternoons new release!! This fun digi is just one of a brand new set in the BUG SHOP. Isn't she SOOOOOO Spooky-Cute?! Head over to check out the whole collection! Good Morning! Today's Marvelous Monday at Shelly's Images, so you'll want to head over to the SI SHOP right away! For today only, the stamp I've used on my card below is discounted! 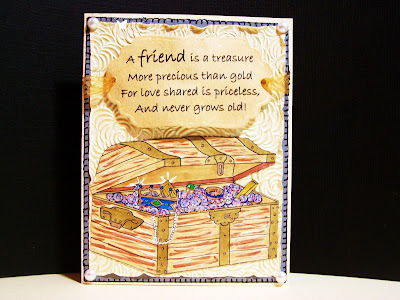 Go check out 'Treasure Chest' and all of the other fab digis in the SI SHOP right away! 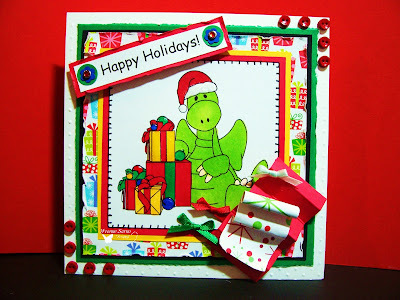 This week the Pile it On challenge is being sponsored by Stamping Dragon! You gotta go and check out some of their awesome stamps HERE. They are truly wonderful and I've had such a blast playing with them, that I ended up completing two cards (so far) with them! Be sure to check back here if you want to see the other one in a little while! 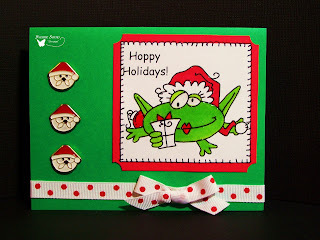 The Pile it On Challenge this week is another fun and easy one - Christmas cards with a twist - red, green, and white + something soft! 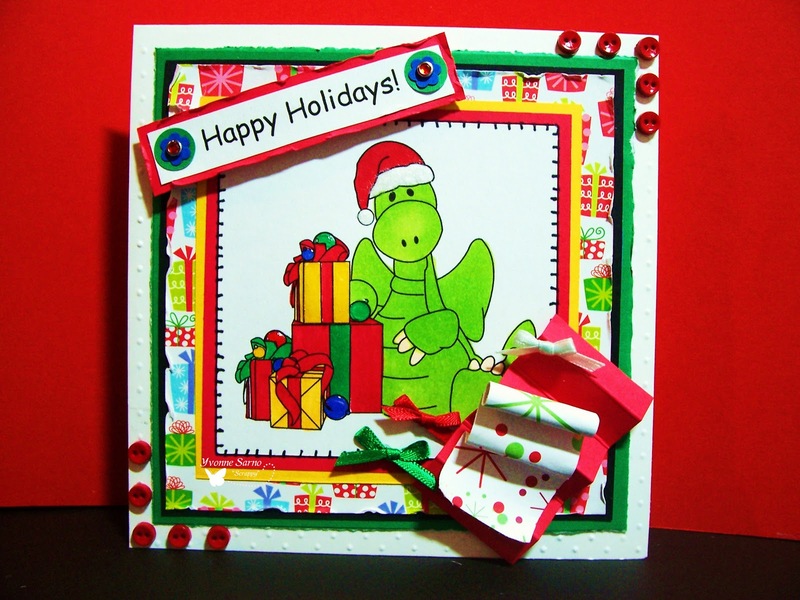 My card below features 'Happy Christmas Jiggy' one of Stamping Dragon's digis! I hope you'll join us for this weeks PIO Challenge! Edit: The dp comes from Me and My Big Ideas. I hand-tied the miniature bows myself - they are about .5" wide each. The 'roll of wrap' is my first attempt at quilling. It is purposely very loose, so it unfurls when the card is opened. 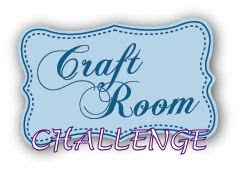 There is a new inpsiration challenge up at Crafty Ho's Challenges! 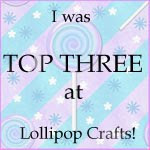 Check out the HO BLOG for more details and to link up your own wonderful creations! 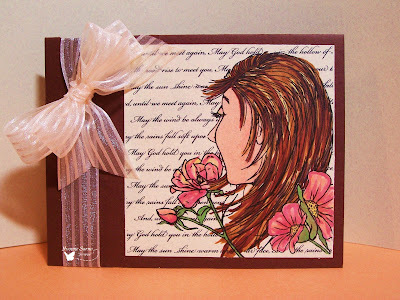 My card below features a fantastic stamp from Purple Panda Designs! I punched the tiny leaves out of some printed dp and cs scraps I hadn't tossed into the recycling bin yet - in effect recycling them myself! The illustrator for Purple Panda Designs is only 16 years old and is extremely talented! Kayla's stamps are AWESOME and you really gotta check them out!! In the interim, I hope you will check out my card below and leave me some love! Thanks, and hope you have a blessed Sunday! Childhood apraxia of speech (CAS) is a motor speech disorder. Children with Apraxia have problems saying sounds, syllables, and words. -but not because of muscle weakness or paralysis. The brain has problems planning to move the body parts (e.g., lips, jaw, tongue) needed for speech. The child knows what he or she wants to say, but his/her brain has difficulty coordinating the muscle movements necessary to say those words. It is incredibly frustrating both for the child as well as for those struggling to understand them. 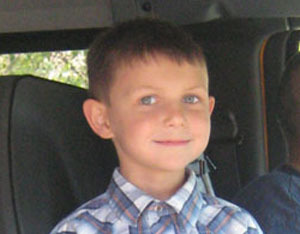 Our friend 'Nicky' has Apraxia. Nicky is only 4 years old but he has just completed a 3 mile walkathon for Apraxia. Unfortunately, for Nicky and other apraxic kids, many people have never heard of this disorder. Because of this, Apraxia research and funding is extremely limited. In fact, CASANA is the only recognized association in North America that supports education and research for children with Apraxia. Here is a link to his page if you are interested in donating to help children with Apraxia. Please remember that ever bit counts! CASANA doesn't use a ribbon to represent them, instead they use a symbol of a child reaching for stars. 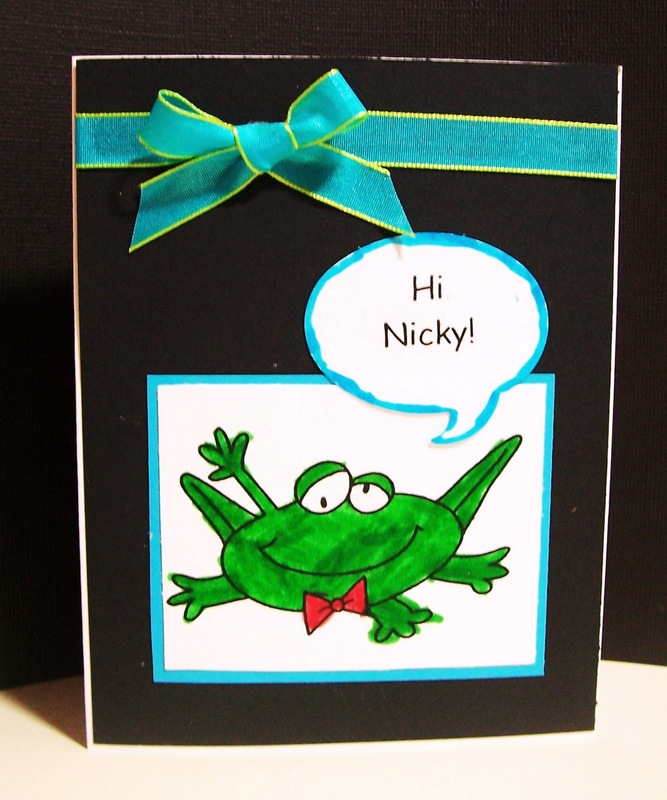 Since Nicky LOVES frogs, I decided to use a frog reaching for stars! My own 4 year old daughter, has also made her own card to support her 'boyfriend' Nicky. You can see both cards featuring Bugaboo Stamps Hoppy Occassions Groom below. 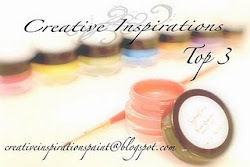 Create with Connie and Mary: Inspired by colors in pic. This cute and cuddly digi belongs to a line called 'Pink Ribbon Bunnies and Bears', which was created in honor of Breast Cancer Awareness. The one I've used below and more are available in the BUG SHOP today. Be sure to check them all out and to nab your freebie while you're there! I'm back again to show off another of Designed to Delight's digital stamps! These elegant flowers are this weeks latest stamp for their progressive challenge! How cool is that?! Good Morning everyone! It's Thursday, which means it's OBG day for the DT at Bugaboo Stamps. 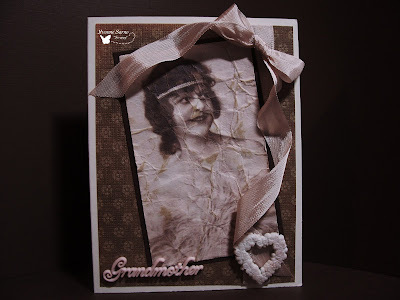 On Thursdays, some of the Bugaboo DT shows off their creations featuring some of their favorite Bugaboo Stamps images that are not part of the current release. 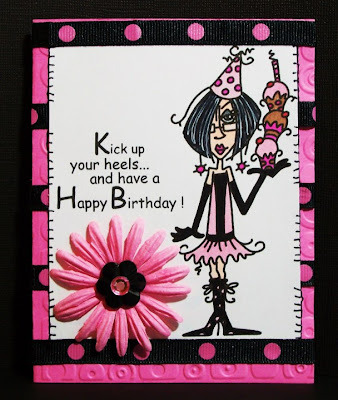 I hope you like my card below featuring a digi from the JJ Tequila and Shoes line at Bugaboo Stamps. Be sure to check out this digi and all of the other wonderful digis in the Bug Shop! 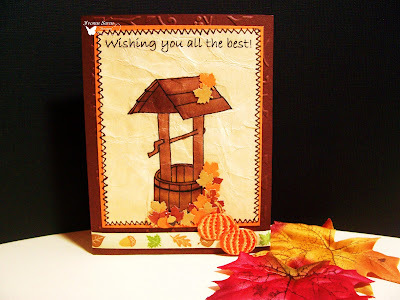 10/19 New Release at Bugaboo Stamps! 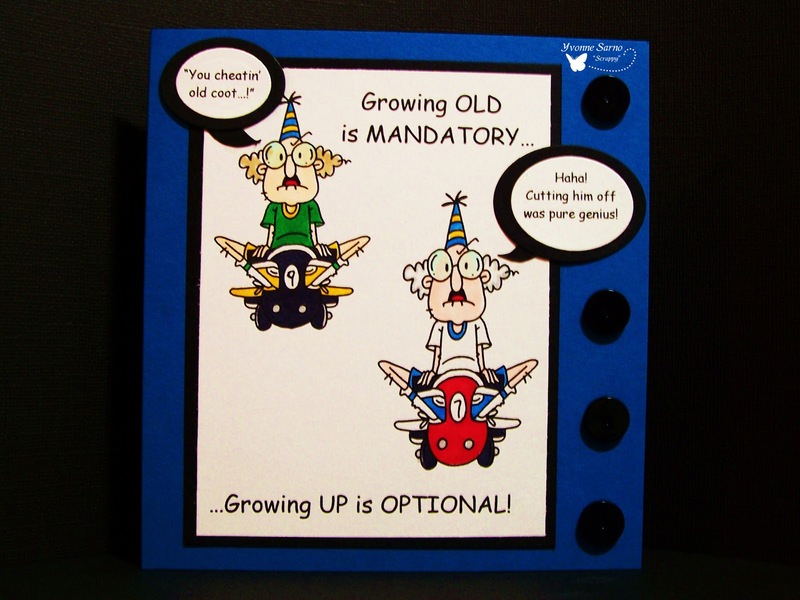 Today is New Release day at Bugaboo Stamps, and I am super excited to share this afternoons new release!! This fun digi is just one of a brand new set in the BUG SHOP called 'Gus Birthday'. Gotta love me some GUS!! How 'bout you? MORE new stuff at Bugaboo! WOOT WOOT!!!! Bugaboo Stamps has even more super cool stuff in the BUG SHOP today! Lucky for me, I get to show you some of it! Check out what I made with some of the new Halloween Bugaboo Brats and accessories! Pile it On with KAH-wink-E-dink! Check it out at AIFactory! Java moment? 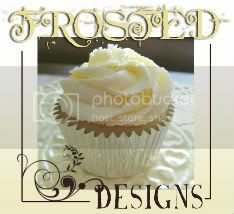 Check out Fresh Brewed Designs! MORE about what's going on at Bugaboo! 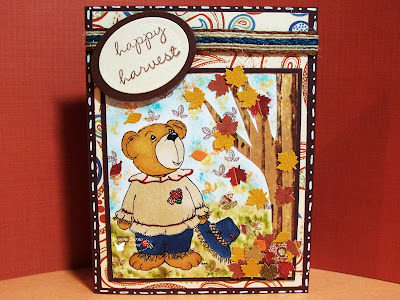 10/5 New Release at Bugaboo Stamps! Psst....Guess what's up at Bugaboo? World Cardmaking Day Challenge at Bugaboo Stamps!